Weather – drizzly with some showers on land, but overcast with sunny periods at sea. One or two showers, but predominantly fine. c. 15 knot NW wind, open sea 1.5-2m swell, with some chop, making it a little uncomfortable at times. Water temp 19.8 C in harbour, 20.1 C in deep water. The birding was a little slow early on with scattered fluttering shearwaters and 2 little penguin seen in Mercury Bay. As we headed out into more open water scattered grey-faced and black petrel started to appear (at a distance), along with Buller’s and flesh-footed shearwater. We headed out towards the Mercury Islands and then when in open water, headed due east out to deeper water, between the 200-300 m line. As we got into deeper water the number of ‘dark’ seabirds started to increase and we started to get better views of the birds as they came in closer to the boat. Several distant ‘Cookilaria’ petrels taunted viewers. At about 1330 we arrived at the 200-300m mark (approx 30 km offshore from the mouth of Mercury Bay) and slowed and started chumming with a small amount of fish guts we had, plus some old bread, and popcorn soaked in cod-liver oil. Almost before we had started to throw this out a ‘Cookilaria’ came right in close at the back of the boat, but despite everyone getting good views, no one was willing to pin it down as either Cook’s or Pycroft’s. We got a bit of a slick going and patrolled this several times, getting great views of black petrel, as well as flesh-footed and Buller’s shearwater and grey-faced petrels. Another’Cookilaria’ came in close to the boat and this bird was a fairly probable Pycroft’s, showing a reasonably dark cap with large dark ear coverts, and very little pale forehead. There was certainly no white showing in the tail (but this may not be diagnostic) which did appear long. After rolling about in the swell for approximately an hour we started to head back in towards the Mercury Islands. This was hard going against the swell and a little uncomforatble at times. Few birds were seen on the way back in, until about 5 or so kms off Red Mercury when we encountered several flocks of Buller’s shearwater on the water. 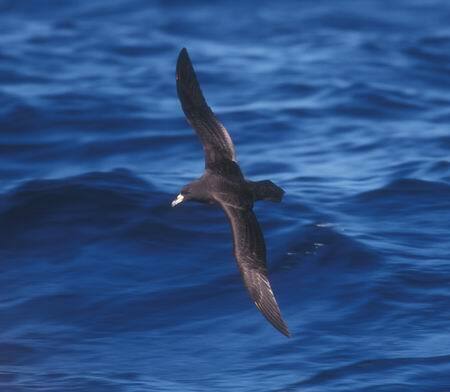 Several black petrel were also amongst them and we had excellent views of both these again. An interesting bird was an aberrant black petrel, which had a clear white eye ring and appeared to have a white chin as well. The bird was clearly a black petrel, and hopefully photos will enable a closer examination. We arrived in the lee of Red Mercury at about 1630 and sheltered in the calm until 1740, hoping to see petrels starting to raft up offshore. Unfortunately, we had to leave a little early and although we could see large numbers of birds moving out further, nothing was coming in closer by the time we left and headed back to port. A great finale to the trip was a beautiful Arctic skua in full breeding plumage with spectacular tail streamers at the back of the boat in the fading light.